Sitting up and crawling are signs your baby is growing. Did you know her vision has stages of development too? InfantSEE provides eye health and vision assessments to infants age 6 to 12 months at NO COST to you. 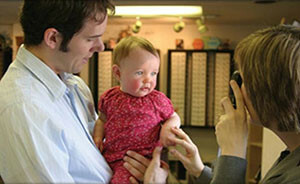 Our doctors encourage all parents to include a trip to the optometrist on the list of well-baby check-ups. Dr. Phillips and Dr. Borstad will check to make sure your baby can see, check to see if their eyes are straight, and if they’re eyes are healthy; and YES, they can do all this even though your baby can’t talk yet! For older children, we recommend eye examinations at 3 and 5 years of age. Ask us today for an appointment! 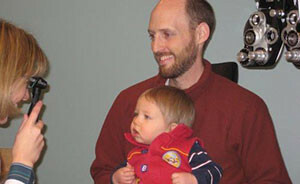 Visit the InfantSEE website for more information.